A cup of tea always tastes better in the woods. I’ve heard that statement said so many times over the years and I guess I have to agree, because from my perspective anyway, it can’t taste worse! One of the best things about a winter day on the pond trouting, or out on atvs and ski-doos though, had to be a boil up. We’d clear out a spot on the shore of a pond, or by the side of a path, and gather up some dry brush, birch bark to start it, and of course blasty boughs and tops. A blasty bough is something you know when you see it, but kind of hard to describe. The best ones were the top of a fir, dried to a bone gray with needles clinging to it, ready to give off a tremendous heat, and easy to burn even when covered with snow once it was shook off. We’d likely have an old graves apple juice can with the top cut out of it, wire strung in it, filled with snow and hung over the roaring fire to make a cup of tea. The needles and twigs dropping in the water probably added flavour. 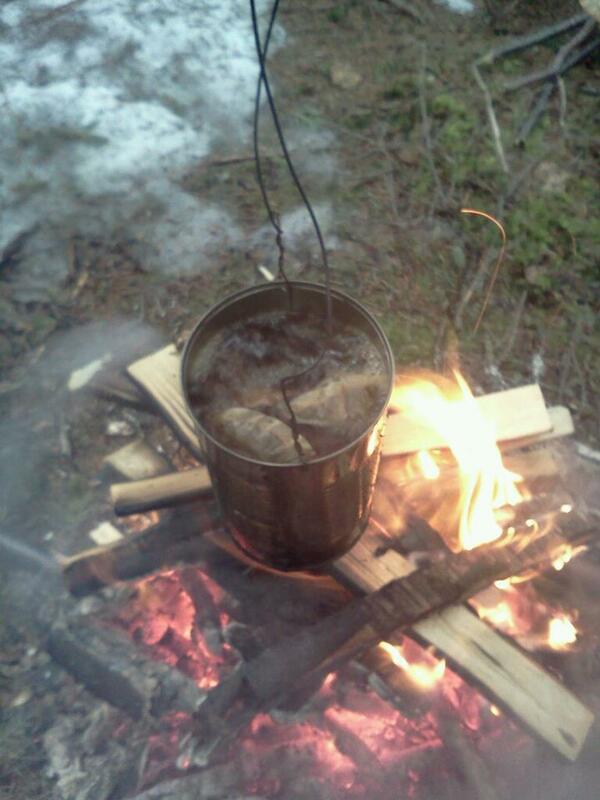 And of course, kipper snacks and sardines to eat, put on a forked stick over the fire, or eaten out of the can. If we were lucky enough to catch a trout, it might be on a stick over the fire too, eaten with our fingers, burning the tips and jabbing them in a snow bank. Tea was poured into an enamel or tin cup, (or for me anyway coffee, yes I’m different), drank scalding hot. Ah yes, memories of times with dad come fresh to mind, times with Eric and Rod too, trouting on Smith’s Long Pond. Good days. Not just the needles but also the bits of ash fell in the tea! No wonder it tastes better with all those extra ingredients!